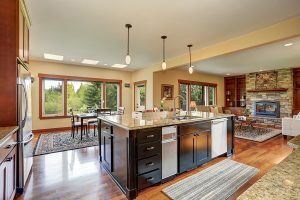 Looking for a countertop material can be a time consuming and stressful process considering the number of materials on the market. If you want a natural stone material for your countertops, then soapstone is the best option for you and your family. Whether you want to install soapstone in your kitchen or bathroom, it will enhance the look and feel of any area. Discover the never-ending benefits of investing is soapstone countertops for your home. One of the major benefits of soapstone countertops is that they are extremely durable and long-lasting. It is an extremely pliable material, so it stands up well everyday wear and tear and weight. Soapstone is perfect for installing in a kitchen because the effects of cooking will not damage it. It is a great work surface for any home, and it is an investment that will last many years to come. When it comes to soapstone, it is one of the most aesthetically pleasing countertop materials on the market. Its natural appeal fits in well in rustic, traditional homes, but can also be installed in a luxurious property. Soapstone comes in shades ranging from pure white to gray so that it can blend in seamlessly with the rest of your home. No two slabs of soapstone are the same, so you are sure to have unique countertops installed in your home. Soapstone is a non-porous material, so you will never have to worry about it absorbing any liquids. Many substances can just be wiped up with a mild soap and water. The material is highly resistant to staining, so it is the perfect material to install into a busy kitchen. Soapstone is a very dense material, so it doesn’t require sealing compared to other materials. This entry was posted on Friday, March 16th, 2018 at 3:11 pm. Both comments and pings are currently closed.